PennJersey Celebrates Beam Signing for the New Seaman Avenue Elementary School in Perth Amboy! The Seaman Avenue Site was acquired by the Perth Amboy Board of Education (PABOE) in 1993 with the intention of constructing a new elementary school. 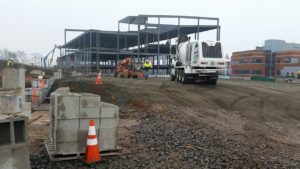 After ~20 years of no construction progress, and to alleviate over-crowding in this school district, the New Jersey Schools Development Authority (NJSDA) is constructing a new $56.4 million elementary school on this site to serve 800 students. Portions of the Site were historically used for fuel oil storage and supply by D.B. Brown and Standard Oil, a trucking facility, a cold storage warehouse, an hospital annex, junk and scrap metal yard, a roofing storage facility and several residences. PennJersey was initially retained in January 2014 to provide historical file review services of three rounds of historic remediation efforts. Following issuance of our report in May 2014, the NJSDA approved funding for the new school construction in August 2014. PennJersey was then contracted by the PABOE to conduct extensive follow-up soil and groundwater remedial investigations, remedial alternatives analysis, and demolition (Early Site Preparation) related remedial actions pursuant to the NJDEP Presumptive Remedies to allow construction to proceed in a safe, effective and cost-efficient manner. On behalf of the PABOE, PennJersey reviewed the NJSDA Design-Build final remedial designs and is currently inspecting the progress of the NJSDA construction and capping operations on behalf of the District to confirm compliance with the remedial action workplan prepared by PennJersey. Mr. Call holds a geology degree from Rensselaer Polytechnic Institute and has provided environmental services since 1987. Mr. Call is a Professional Geologist (PA & AR) as well as a Licensed Site Remediation Professional and serves on the Board of Trustees of the Licensed Site Remediation Professional Association, where he also serves on the Risk Management and Loss Prevention Committee and co-chairs the Continuing Education Committee. Mr. Call has developed and implemented numerous projects involving investigations of various hazardous waste facilities and related site remediation projects. These projects have included State, County, municipal and commercial properties impacted by various operations. Past project experience includes various environmental investigations; remediation of major New Jersey educational, road expansion, and Brownfields projects; sites impaired by leaking underground storage tanks; Industrial Site Remediation Act investigations; Resource Conservation and Recovery Act site closures; and extensive hydrogeological investigations. When he is not cleaning up New Jersey one site at a time, he dedicates his free time to taking care of his young daughter, a new home and getting in some crossbow archery. As a new homeowner in town, Mr. Call is also joining the Middletown Township Environmental Commission.